graphic organizers: How is Textmapping similar to, and different from, other graphic organizers? learning styles: How do scrolls and Textmapping accomodate different learning styles? all reading from scrolls: Are you proposing that all reading be done from scrolls? grade levels: For which grade levels can scrolls and Textmapping be used? levels of reading: Can scrolls and Textmapping be used for all levels of reading? ESL: Can scrolls and Textmapping be used to teach ESL students? fiction and non-fiction: Can scrolls and Textmapping be used for fiction as well as non-fiction? balanced instruction: How do scrolls and Textmapping support Balanced Instruction? comprehension routines: How do scrolls and Textmapping support instruction in common comprehension routines? copying and fair use: If I photocopy a copyrighted work to make a scroll, am I breaking the law? copy quality and color copies: The quality of black and white copies of color illustrations is very poor, but I can't afford color copies. What should I do? following along in a book: When I'm previewing a scrolled text in front of my class, should I allow my students to follow along in their books? 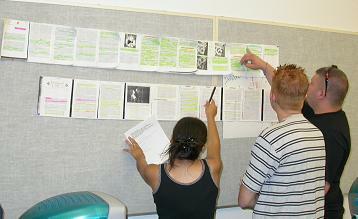 seeing the words: How can all of the students see the print when the scroll is way up front, hanging on the blackboard? how many scrolls to make: How many scrolls do you need to teach a class of students? small groups or whole class: Is it best to use scrolls and Textmapping with small groups or the whole class? previewing a short story: How would I use Textmapping to preview a short story with my students? color codes and markers: Are there any general guidelines regarding color coding? Is it best to use markers, crayons, pens, or pencils? How is Textmapping similar to, and different from, other graphic organizers? Fourth and fifth grade students collaborate to map a difficult text. They can see at a glance the layout and content across many pages. This encourages them to stretch, question and discuss. Textmapping accomodates a wider range of learning styles. Other graphic organizers accomodate visual learners. Textmapping accomodates visual, spatial, tactile, kinaesthetic, and global learners. For more on this, see learning styles. Unlike other graphic organizers, Textmapping is a true pre-reading technique [http://www.textmapping.org/benefits.html#postponeAuditory], i.e., it is not necessary to read a text in order to begin mapping it. Unlike other graphic organizers which have the word "mapping" in their name, Textmapping is a true mapping technique[http://www.textmapping.org/researchCall.html#mapDiagram]. All other graphic organizers are actually diagramming techniques. unlike other graphic organizers, Textmapping produces a traceable record of a reader's thought process [benefit #5] [http://www.textmapping.org/benefits.html#traceableRecord]. 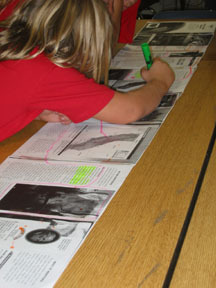 Unlike other graphic organizers, Textmapping encourages active reading through movement [benefit #3] [http://www.textmapping.org/benefits.html#active]. Textmapping complements other graphic organizers by bridging the gap between an unread text and its corresponding abstracted diagram; it provides a transitional capability - one in which graphic organizer techniques are first applied directly to the text itself. This is a unique and valuable addition that greatly extends the graphic organizer toolbox. You will find more information about using Textmapping with other graphic organizers on the lesson guides page. How do scrolls and Textmapping accomodate different learning styles? A fifth grade girl is actively engaged in the process of marking her scroll. Scrolls and Textmapping encourage hands-on learning for visual, spatial, tactile, kinaesthetic, and global learners. Visual learners benefit from being able to see a text as a complete, unbroken whole. For more on this, read about scrolls [http://www.textmapping.org/scrolls.html"]. Visual learners also benefit from Textmapping, which illuminates text typography [see notes at the end of this FAQ sheet], making a text's graphic features and configuration fully accessible and comprehensible at a glance. For more on this, read about mapping [http://www.textmapping.org/mapping.html"]. Spatial and kineasthetic learners are better able to comprehend scrolled text because it gives them a feel for where things are. By way of analogy, scrolls and typography [see notes at the end of this FAQ sheet] are to text what maps and topography are to land. Each scrolled text is a unique graphic entity with it's own unique "lay of the land". For spatial and kinaesthetic learners, the simple act of unrolling a scroll and walking back and forth along its length opens a concrete "way in" to an otherwise abstract world. Kinaesthetic and tactile learners can appreciate the fact that scrolls and Textmapping encourage a level and range of physical interaction with text that simply is not available when reading from books. Students reading scrolls spend a lot of time walking, crawling, "zooming in" (moving closer), "zooming out" (stepping back), leaning, poking, pointing, smoothing, cutting, taping, gluing, annotating, highlighting, and drawing circles, boxes, symbols and arrows. For kinaesthetic and tactile learners, this compares very favorably indeed to sitting quietly in a chair. Reading is re-defined as a "contact sport" - a sport in which more contact means more learning. For more on this, see benefit #3 [http://www.textmapping.org/benefits.html#active]. Global learners benefit from being able to see the "big picture" at all times. This is crucial for them because without the full context, global learners are lost. In the same vein, the process of mapping a scroll helps global learners gain a much clearer understanding of how the details relate to the big picture. For more on this, see benefit #2 [http://www.textmapping.org/benefits.html#wholeView]. For more on learning styles, see Richard Felder & Barbara Solomon, Learning Styles and Strategies [http://www.engr.ncsu.edu/learningstyles/ilsweb.html] and Georgia State University Master Teacher Program: On Learning Styles [http://www.gsu.edu/~dschjb/wwwmbti.html]. Community college students collaborate on mapping a scroll in a reading and study skills class. Scrolls and Textmapping are a means to an end. The goal is for all students to read, with full comprehension, from books. Are you proposing that all reading be done from scrolls? No, that is neither realistic nor useful. We are advocating the use of scrolls for a significant portion of classroom instruction and classroom-related reading, but that is not the same as advocating that all reading should be done from scrolls. Rather, scrolls are a means to an end - which is to have students become highly proficient at reading books and other paged-media [see notes at end of this FAQ sheet]. Scrolls should be used to help students become better readers of the kinds of texts which they will encounter once they leave school and enter the working world. Today's (and tomorrow's) students will not encounter scrolls in the working world. They will encounter books, magazines and journals, web pages, word processing documents, and other forms of paged-media [see notes at end of this FAQ sheet]. Scrolls should be used often and repeatedly in the classroom to prepare students to read books out of the classroom. For most readers, scrolls should be a transitional technology for teaching and learning, with the goal being that students will become better readers of paged-media [see notes at end of this FAQ sheet]. There is, however, an interesting argument to be made in favor of encouraging a limited segment of the population - some learning disabled and struggling readers - to read from scrolls instead of books outside the classrooom. For these readers, scrolls may be a better choice - and, arguably, the only choice - because paged-media may be one of the main barriers to their reading success. For more on this topic, see Remediate the Text [http://www.textmapping.org/middlebrookScrolls.10.02.03.html] and our entry on learning styles on this FAQ page. The technology to produce texts in scroll form has long been available, and newer technologies such as XML and CSS make the process easy to set up, but the social and commercial barriers to using scrolls are significant. Paged-media has been the dominant media for text for over 1000 years. Consequently, even though making scrolls is not difficult, and even if the argument in favor of using scrolls for some readers proves to be a strong one, it may be a long time before scrolled texts are commercially available. In the mean time, it is possible for LD and struggling readers to make their own scrolls. They don't need to wait for educators, publishers, and the public to see the argument. That said, the larger point remains: scrolls should be used to improve instruction in the skills needed for reading books and other paged-media. The goal is for all students to read, with full comprehension, from books. Community college students collaborate on mapping a scroll in a reading and study skills class. Scrolls and Textmapping are appropriate for all grade levels, including college. Scrolls encourage active engagement, collaboration, and thoughtful discussion. For which grade levels should scrolls and Textmapping be used? Scrolls and Textmapping are appropriate for all grade levels - from pre-school through college and adult education. In principle, implementation is the same across all grade levels, although the details will vary considerably in response to reading level, text difficulty, the particular task at hand, and instructional goals. For example, if you are working with third graders, instead of taping a scroll to the blackboard, you might try unrolling it on the classroom floor. Have the students take off their shoes (but keep their socks on) and walk on the scroll as they explore it. This is a fun way to experience text, and a great way to introduce the idea of active reading. For more on this, see benefit #3 [http://www.textmapping.org/benefits.html#active] and learning styles [see the "learning styles" entry, above]. 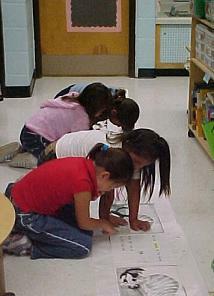 Second graders map a scroll on the floor. Scrolls and Textmapping are appropriate for all grade levels, including elementary school. Scrolls encourage active engagement, collaboration, and thoughtful discussion. With elementary students, you might take a more formulaic approach to the mapping [http://www.textmapping.org/mapping.html]. In addition, you would most certainly use lots of color, stickers, and post-it notes. On the other hand, while you might sometimes use colored markers and post-it notes while working with community college students, there will be times when you will want these same students to use just a single color of pen (and perhaps a yellow highlighter) to comprehend a text - because in the working world, that is what they will be expected to be able to do. An important guiding principle is that, at all grade levels, there are situations which require clear and explicit instruction - scrolls, colored markers, stickers, and post-it notes are all useful for these purposes - but as students develop more expertise with comprehension, you also want to encourage them to transfer the skills learned through these explicit means to the less-colorful, more-abstract, real-world practice of book-based reading. In other words, for all grade levels, scrolls and Textmapping should be used in the classroom to prepare students to read books out of the classroom. For more on this important point, see our entry on all reading from scrolls. You will find more information about using Textmapping with different grade levels on the lesson guides page. The term "elementary reading" is used here with reference to Adler & Van Doren (see citation at end of this FAQ sheet). Scrolls and Textmapping can be very helpful to beginning readers. These readers are struggling to learn decoding skills and build vocabulary. By necessity, they spend their time reading from a "ground-level", rather than "birds-eye", perspective, focusing on word-, sentence-, and paragraph-level comprehension. This is not a bad thing in and of itself - in fact, it is a necessary part of learning to read. But it does mean that they have few (if any) opportunities to experience reading as a strategic process and to realize that this is really what reading is all about. The earlier that students can experience reading as a strategic process and develop strategic reading awareness (the skills and understanding will come later), the more likely it is that they will be able to develop advanced comprehension skills in later years. Many students do not progress beyond the elementary reading level, in part because they never experience reading as a strategic process, and so never really come to understand that there is more to reading than starting at the beginning and reading straight through until the text runs out. Scrolls and Textmapping can be used to expose elementary readers to reading as a strategic process and to model what it means to be an engaged, inquisitive, active, strategic reader. Scrolls and Textmapping also offer the related benefit of being useful to students who are struggling with the most basic comprehension skills, such as using context to guide comprehension of words. Context is important to understanding unfamiliar words, as well as for assigning the correct meaning to familiar words (e.g., does "race" refer to a competition, or to a group of people?). Scrolls enable students to see the full context for a word - the entire text - in a single glance. Textmapping enables students to see how that context is divided into smaller chunks, each of which can influence the sense of individual words in important ways. The term "inspectional reading" is used here with reference to Adler & Van Doren (see citation at end of this FAQ sheet). This is perhaps the best use for scrolls and Textmapping, because it is at this stage that the reader is most interested in trying to understand the "big picture". This is accomplished in books through an iterative process of skimming and scanning: reading through the table of contents, index, glossary, introductory text and appendices; leafing through the pages, looking at the illustrations, reading the headings and sub-headings; and all the while questioning, anticipating, drawing inferences and jotting down notes and annotations. This critical and complex process, which can not be demonstrated in any meaningful way using books, can be modeled clearly and explicitly on scrolls. Moreover, it can be practiced by unskilled readers with much greater speed and accuracy on scrolls than in books. That said, the goal is for all students to read, with full comprehension, from books and other paged-media [see notes at end of this FAQ sheet]. Scrolls and Textmapping are better than books for modeling and practicing inspectional reading skills in the classroom, so that students may be prepared to read books out of the classroom. For more on this important point, see our entry on all reading from scrolls. The term "analytical reading" is used here with reference to Adler & Van Doren (see citation at end of this FAQ sheet). The term "syntopical reading" is used here with reference to Adler & Van Doren (see citation at end of this FAQ sheet). You will find more information about using Textmapping with different levels of reading on the lesson guides page. Can scrolls and Textmapping be used to teach ESL students? ESL teachers are already using scrolls and Textmapping in their classrooms. Scrolls and Textmapping were first developed to address the needs of LD students. That said, many of the methods used to reach LD students have been found to be useful for teaching ESL and regular education students as well. Scrolls and Textmapping help teachers make instruction explicit and systematic. This is beneficial to all learners. Scrolls and Textmapping form a particularly robust and flexible platform for multisensory instruction and learning. This can be very beneficial in helping ESL students compensate for the many cultural and linguistic challenges that they face when trying to learn in a language that is foreign to their upbringing and life experience. scaffolding upon strategically selected linguistic and non-linguistic cues to text organization and meaning (such as typography and pictures). using specific pre-reading strategies (skimming, scanning, surveying, questioning, inferring, predicting) to drive and manage the scaffolding process. Can scrolls and Textmapping be used for fiction as well as non-fiction? Scrolls and Textmapping can be used for both fiction and non-fiction reading and instruction - anytime the purpose is reading for information or reading for understanding. This means, for example, that they are appropriate for use in a literature course, for reading and teaching fiction. It is fair to say, however, that the uses for non-fiction are more numerous and more obvious than those for fiction. For an example of how scrolls and Textmapping can be used to teach fiction, see Case Exercise: Short Fiction Novel. Also see Previewing a Short Story. Scrolls, like books, are simply a medium for text. Scrolls offer clear advantages over books for teaching and learning. These advantages apply equally to the study of non-fiction and fiction. Note that this is not an argument for all reading from scrolls. Mapping, like margin notation, is a method of marking text - but it offers considerably more functionality and flexibility, which makes it equally useful for studying fiction and non-fiction. There are seven key instructional benefits to using Textmapping, all of which apply to the study of fiction as well as non-fiction. Scrolls and Textmapping complement, enrich, and extend the opportunities provided by balanced instruction when working with fiction, as well as with non-fiction. You will find more information about using Textmapping with fiction on the lesson guides page. How do scrolls and Textmapping work with the Balanced Instruction model? Textmapping is practiced on scrolls[http://www.textmapping.org/scrolls.html]. Scrolls are an ancient technology, but they offer clear advantages over books - advantages that are particularly useful in the context of classroom instruction. 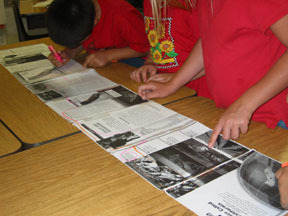 Specifically, Scrolls provide a better handle [see http://www.textmapping.org/scrolls.html] for modeling and achieving comprehension. Scrolls enable the eye to comprehend [see http://www.textmapping.org/scrolls.html], revealing details and themes which might otherwise go unnoticed, thus enriching the discussion. And unlike school-owned textbooks and library books, scrolls can be marked, thus creating the necessary conditions for a truely engaged and active conversation with text. 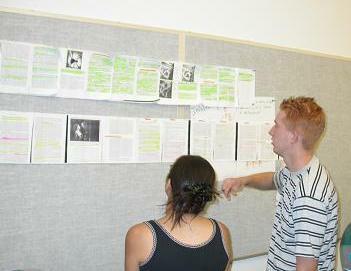 Scrolls and Textmapping accomodate a wide range of learning styles[http://www.textmapping.org/lessonFAQ.html#learningStyles], which enables balanced instruction to be adapted to the needs of a wide range of learners. You will find more information about Balanced Instruction and Textmapping on the lesson guides page. Scrolls and Textmapping are a perfect fit with Guided Reading. From the introduction of a text, through reading (whether independent or characterized by some level of guidance) and post reading, scrolls are the ideal environment for a Guided Reading program. Scrolls also help with assessment by providing a much more detailed and concrete record for establishing a baseline reading skill-level and charting progress for each student. You will find more information about Guided Reading and Textmapping on the lesson guides page. Textmapping provides an ideal environment for independent reading, and for reading comprehension skills practice [benefit #2, benefit #3, and benefit #4] [see http://www.textmapping.org/benefits.org]. It is particularly useful for fostering good independent reading practices in struggling and learning disabled readers [benefit #7]. And because the process of mapping [www.textmapping.org/mapping.html] a text produces a traceable record [benefit #5] teachers have greater flexibility and control when assigning and monitoring students' independent reading. You will find more information about independent reading and Textmapping on the lesson guides page. Textmapping can be used with Guided Imagery to explicitly anchor the imagery to the text. For example, in preparation for reading a story, students might draw upon their own experiences to imagine something about certain aspects of the story such as the characters, settings, or plot line. Each of these imaginings can then be written down and connected (anchored by graphic markings) to specific portions of the scrolled text. Alternatively, students might scan the scroll, stopping every few pages to imagine something based upon information gleaned from a cursory skimming of the page (something about cold weather?...losing a pet?...walking to school?...eating ice-cream? Each imagined response can be anchored to the location on the scroll which served as the inspiration. It clarifies the relationship between the students' imaginings and the text. Where do the imaginings and the text correspond - i.e., where has the imagery proven to be on target? Where do the imaginings and the text diverge - i.e., where has the imagery missed the mark? And how does this lead the students to reevaluate their schema and/or their comprehension of the text? Text portions to which no imagery has been linked can be clearly seen. This prompts students to consider whether they might have missed anything - whether "un-imagined" text portions might spring to life with the help of some imagination. You will find more information about using Guided Imagery with Textmapping on the lesson guides page. Textmapping can be used for writing across the curriculum, exposing and illustrating the connections between reading and writing. Students can map their own written work - much as they map texts written by others - and in so doing, can clearly see the extent to which their work exhibits (or lacks) desirable qualities, such as clarity, coherence, and persuasiveness. This sets the scene for students to edit their written work - with an improved sense of what needs to be done and why. The ultimate result is that, through Textmapping, students can significantly improve their understanding of the writing process - which can lead to improvments in reading as well. How do scrolls and Textmapping support instruction in common comprehension routines? If I photocopy a copyrighted work to make a scroll, am I breaking the law? We believe that copying to make scrolls is allowed under fair use, provided certain conditions are met. For more information, read about copying and fair use [http://www.textmapping.org/fairUse.html]. The quality of black and white copies of color illustrations is very poor, but I can't afford color copies. What should I do? Let your students color the illustrations on the scroll. This isn't just idle play; it requires them to make decisions - to look closely at the illustrations and choose colors that make sense. Let your students make their own illustrations - either drawn free-hand, or based on tracings of the original illuatrations. The kind of "retelling" that students engage in through drawing and coloring is good for comprehension. Having students add color and detail to the illustrations - as well as adding their own embellishments - is a great way to engage the kids in thinking more deeply about the text through hands-on interaction. It all adds up to an invitation to "get inside" of a text; to engage and interact; to pay close attention to details; to question and infer; to revisit and reconsider; and in short, to comprehend by making the text their own. When I'm previewing a scrolled text in front of my class, should I allow my students to follow along in their books? It depends upon your instructional goals and the needs of your students. As a general principle, if you are previewing/introducing new material to an entire class, it is best if students do not follow along in their books. Have them get up from their chairs and gather at the front of the room (or wherever you have the scroll). Have them stand close enough to the scroll to feel engaged and "in the action", yet far enough away so that they don't lose sight of the "big picture". This usually means that seeing the words will be difficult (perhaps impossible) without stepping closer - and that's fine. You want them to focus on the big picture. If they are standing with you, near the scroll, and need to see more detail (a heading or caption, a paragraph, a word or two), it will be easy for them to "zoom in" by simply taking a few steps forward. The advantage of having everyone focused on a single scroll is that it keeps everyone, literally, on the same page. It also keeps the dialog between and among you and your students tightly and concretely focused on the text. There are fewer opportunities for confusion. If a student has an insight or question, she can easily point to the relevant text portions to show everyone exactly what it is she is responding to in the text. This is an important advantage that is lost as soon as everyone returns to their seats and opens their books. How can all of the students see the print when the scroll is way up front, hanging on the blackboard? They can't - and you won't want them to. Not, at least, until they have comprehended the typography [see notes at the end of this FAQ sheet]. Until they have done that, the words are actually a distraction. Start by focusing on the graphic information. Your students do not need to be able to read the words to do this. On the other hand, once your students have discussed and comprehended the typography, they will need to start looking at words - reading selected bits of text such as titles, captions, pre-reading cues, and the like. To make this possible, have the entire class get up from their seats, come up to the blackboard, and stand in front of the scroll. From this vantage point, they will still be able to see the entire scroll, and they will also be able to step closer whenever they need to - to read the words that are on the scroll either silently to themselves, or aloud to everyone else. "Mark all of the vocabulary words." "Mark all of the questions." "Draw a box around each sub-section." "Mark those points on the scroll where there are scene-changes in the story". How many scrolls do you need to teach a class of students? It depends upon your instructional goals. The advantage of a single scroll is that it keeps everyone focused on one idea, one task, and one text. The advantage of more scrolls is that students have more opportunities to engage in the text. Hands-on interaction through marking is important. It is best that your students' first exposure to scrolls should be guided by you - working on a single common scroll on the blackboard. As soon as they understand the basic steps in the process, you should allow them to move to small group or individual scrolls. For a different perspective on this topic, read small groups or whole class. Note that in deciding how many scrolls to make, you should also consider how your use of the author's work squares with the principles of fair use [http://www.textmapping.org/fairUse.html]. Is it best to use scrolls and Textmapping with small groups or the whole class? Small groups are arguably better because they provide students more hands-on time. That said, there are situations in which it makes more sense to work together as a class on a single scroll. It is best to reserve gathering the whole class together to those times when you want all eyes on the same scroll and all ears on the same conversation. Certainly, you will want to work as a class on a single scroll the first time you expose your students to scrolls and Textmapping. The danger of gathering everyone together is that you can lose their attention if they get bored, so it makes sense to gather the class around one scroll only when necessary - and when you have to do it, to work quickly. Small groups create the opposite problem: engagement. You will definitely lose your students' attention as they get involved in their own work. And as the noise level in the classroom rises due to all the discussions going on in the small groups, your students will tune out any voices from outside their little group - and that would, of course, include your voice. Small groups can become very focused. This is a good thing, but it may not seem so to you if they are not listening to you. Don't take it personally. Just observe what they are doing in order to confirm that they are on a productive track. And console yourself with the knowledge that you can expect some interesting work from them. If you need to break into their process, do so firmly but politely. Make sure that everyone in the group has stopped working - they may want to keep working. Make sure they are looking at you and listening to you ("eyes and ears"). Say what you have to say. Then let them get back to work! How would I use Textmapping to preview a short story with my students? For complex fiction: If your students are reasonably proficient readers and the story is not too complicated, it might be best to let them read the story first on their own. On the other hand, if something about the story is complicated - the story line, the characters, etc. - you might want to use Textmapping to alert them about what to expect. Just remember that the more you map a story before reading it, the less there is to discover during the reading. This can take some of the fun away from reading fiction. For post-reading discussion: In general, the best use of Textmapping for short stories is after the students have done the reading. At this point, you can all discuss the story with reference to the scrolled version hanging on the classroom wall. This provides a common text about which you and your students can share insights, and is an effective way to bring interesting points to light. Textmapping will enable you to uncover points and patterns that your students might not otherwise see. Your students can learn from this process how to become critical, insightful readers. For pre-reading fiction: You may want to do an initial walk-through with learning disabled students before sending them home to read a short story (or a novel, or even a poem). For example, you might talk about the characters - Who are the characters? When do they appear in the story? What do they do? You might tell your students that they can expect to learn something important about a certain character, and ask them to predict where in the story that will be revealed. There is a lot that you can do to help them build a context for understanding the story, while still leaving them with plenty to discover on their own. They get stuck on the decoding, get tired and frustrated, never get to the end (or even the middle), and learn, yet again, why they hate reading. They are stuck reading less challenging texts that are suitable for their reading abilities, but way below their intellectual abilities. From this they learn, yet again, why they hate reading. Are there any general guidelines regarding color coding? Is it best to use markers, crayons, pens, or pencils? It makes sense to use darker/bolder colors and wider lines - which is what markers and crayons do well - for "top-level" information such as titles and headings, as well as for information that is particularly important. Lighter/softer and thinner lines - which is what pens and pencils do well - are better for details and other information that is less important or farther down the structural hierarchy. pink circle: names, dates, etc. purple: characterization i.e., How are the characters described? and What are their qualities? Not everyone likes color. Too many colors can be overwhelming for some. Some may want to use only a pencil. Some may prefer tracing with their finger - no marking at all; just tactile/kinaesthetic interaction with the scroll. That's fine. Do what works for each student. Hall, Tracey, & Strangman, Nicole; "Graphic Organizers"
Textmapping is a form of text "illumination". Illumination is the ancient art of embellishing text with colorful graphic designs and illustrations. The term "illumination" derives from the Latin word "illumine". The image is of bringing light to a text - and if you have ever seen illuminated text, you will understand just how dazzling it can be. Illuminated texts are stunning works of artistic expression and skilled craftsmanship. In a time when few people knew how to read, illuminated texts were highly valued as much for their amazing beauty as for their content. Even so, the original sense of "illumination", and - it would seem - the intent of those who produced illuminated texts, had more to do with the idea of bringing enlightenment to the reader. The scribes and artisans who produced these texts understood that the embellishments served a purpose which was simultaneously much more mundane and much more powerful: Illumination helped the reader connect with text and draw enlightenment from it. This is a purpose shared, both in form and in substance, by Textmapping. For more on the topic of text illumination, visit the Medieval Manuscripts Project at Central European University [http://www.ceu.hu/medstud/manual/MMM/contents.html]. The term "paged media" is used here to refer to books, magazines, newspapers, and electronic text, all of which break text into discrete pages or (in the case of the electronic text) screen-fulls or views. Scrolls, by comparison, display text as a continuous whole which is fully-visible in a single view. Book technology (the ancient Roman Codex) started replacing scroll technology (the ancient Greek Volumen) about 2000 years ago. After roughly 400 years, the transition was largely complete. By 1000 A.D., other than for religious and ceremonial purposes (in the Jewish religion, for example), scroll technology was all but dead. In short, we've been reading exclusively from books and other paged-media [see note above this one] for well over 1000 years. Mortimer Adler & Charles Van Doren describe four "levels of reading": Elementary Reading, Inspectional Reading, Analytical Reading, and Syntopical Reading. Adler, Mortimer J., and Van Doren, Charles; "How to Read a Book", MJF Books and Simon & Schuster (1940, 1967, 1972) ISBN 1-56731-010-9 . Elementary Reading includes basic decoding and word-, sentence-, and paragraph-level comprehension skills, and is the focus of most reading instruction up through the middle school years. Inspectional Reading includes skimming, scanning, and similar pre-reading skills. Analytical Reading describes the process of fully comprehending a text. Syntopical Reading involves comprehending and drawing connections between different texts and across different topics. Balanced Instruction "...includes both explicit instruction in specific comprehension strategies and a great deal of time and opportunity for actual reading, writing, and discussion of text." Duke, Nell K., and Pearson, P. David; "Effective Practices for Developing Reading Comprehension"
Typography "...deals with all matters that affect the appearance of the page, and that contribute to the effectiveness of a printed message: the shapes and sizes of letters, diacritics, punctuation marks, and special symbols; the distances between letters and words; the length of lines; the space between lines; the size of margins; the extent and location of illustrations; the use of colour; the selection of headings and sub-headings; and all other matters of spatial organization or configuration." Textstream is an invented term. It's meaning and significance can be explained as follows: Imagine that the scroll is a river and the illustrations are boulders in the river; the words are the water - the textstream. Once you have drawn boxes around the illustrations, you can draw a box that follows the contours of the text around the illustrations. What you get looks like a stream flowing down a channel, shifting around boulders along the way. The value of this is that it makes an important point in concrete terms. The point is that the placement of an illustration on a particular page may, or may not, mean anything. It is the reader's job to discover the connections - if any - between illustrations and words. In a textbook, the connections are more likely to be more direct and close by. But, for example, if you try mapping an article from The New York Times Magazine Section, you'll often find that the connections are less direct, and that an illustration on page 8 may not be related to any of the words on the page; rather, it might be related to the words on page 14. So it's a worthwhile exercise to separate the illustrations from the text, and then go about the process of identifying connections. The notion of a textstream is useful in this context.